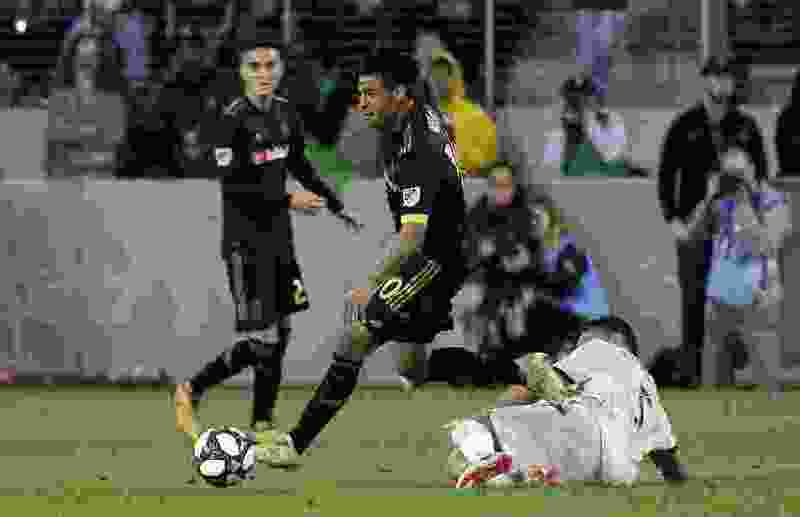 With Real Salt Lake playing short-handed, and Los Angeles Football Club predicting a blowout win before the game, Saturday night at Banc of California Stadium proved to be a battle of wills. Seven yellow cards and a red card were handed out between the two teams. LAFC attacked with reckless abandon. RSL sent an extra man to the back line on defense. In the end, LAFC’s will prevailed as it downed RSL 2-1. Real fell to 1-2-1 on the season, while LAFC improved to 3-0-1. LAFC dominated the game in virtually every statistical category. It outshot, out-blocked, out-cornered and out-possessed RSL. With two minutes left in stoppage time, Walker Zimmerman’s strike appeared to be deflected by defender Erik Holt and sailed into the goal, securing the win. Before that sequence, even playing a man down, Real looked poised to come out of L.A. with a draw. RSL struck first after forcing a penalty on LAFC. Sebastian Saucedo drew a foul on Latif Blessing in the box, and Damir Kreilach buried the penalty shot for a 1-0 RSL lead in the 35th minute. Five minutes later, Diego Rossi equalized. A pass to Rossi was broken up by Donny Toia, and Rossi found the back of the net off the ricochet. It appeared that an LAFC player was in an offside position when the ball was played into the box, but Toia’s deflection negated that fact, and the goal stood. On a similar-looking sequence in the second half, Kreilach dribbled toward the goal looking for a shot, but an LAFC defender dispossessed him. The ball caromed toward Saucedo, who put a right-footed shot into goal and ran away with his hands in air. But Saucedo’s celebration was cut short when a referee signaled that Saucedo was in an offside position when Kreilach made his attempt toward the goal. On that call, it was not ruled that LAFC’s deflection negated Saucedo’s position. After Justin Portillo earned a red card in the 84th minute and left the game, RSL was left without a full complement of players, much like last week against D.C. United when the team finished with only nine men on the field. While RSL fought tooth and nail for eight minutes after Portillo’s ejection, Zimmerman’s goal took what would have been a positive result and turned it into a second straight loss for Real. While RSL had to settle for the draw, it was a positive development for a team coming off an ugly loss just a week prior. Four players — Tate Schmitt, Erik Holt, Justin Portillo and Luis Arriaga — made their Major League Soccer debuts, but the team’s overall cohesiveness on the field did not appear affected much.